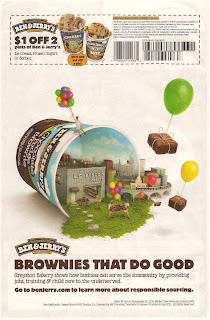 Greyston Bakery, a social enterprise, has been supplying Ben & Jerry’s with brownies since 1990, and now the company has decided to feature the bakery and its mission in an integrated campaign of television and print ads. The TV ads feature a kind of diorama of the Greyston Bakery factory… designed by Maya Lin… on the Hudson River in Yonkers, New York. We see two hands prepare a cup of Ben & Jerry’s Chocolate Fudge Brownie to house the Greyston Factory, along other Yonkers landmarks, before the hand rings the factory’s bell. Greyston Bakery supports the work of the Greyston Foundation, whose mission is to hire and support low income New Yorkers. Greyston famously hires the hard-to-employ, “offering on-site training and fair wages and benefits to more than 65 local residents, regardless of their work history,” the website says. The challenge of this kind of advertising is to deliver something as good as the cause (and the ice cream) without turning maudlin. The TV ad isn’t overly-sentimental, but it’s not inspired either. Instead it occupies that vast middle ground that most advertising does. Fine, but no more than fine. A pity the agency couldn’t find more inspiration from one of the most interesting cause marketing relationships anywhere.